Are you prepared for your next infectious disease? Dudick Inc is and we are experts in ABSL-3 and BSL-4 high containment infectious disease facilities and vivariums. Our seamless, no joint, floor systems can withstand heavy duty decontamination cleaning and are 100% pinhole free. You can count on Dudick Inc to make sure you are prepared with our wall and floor systems! 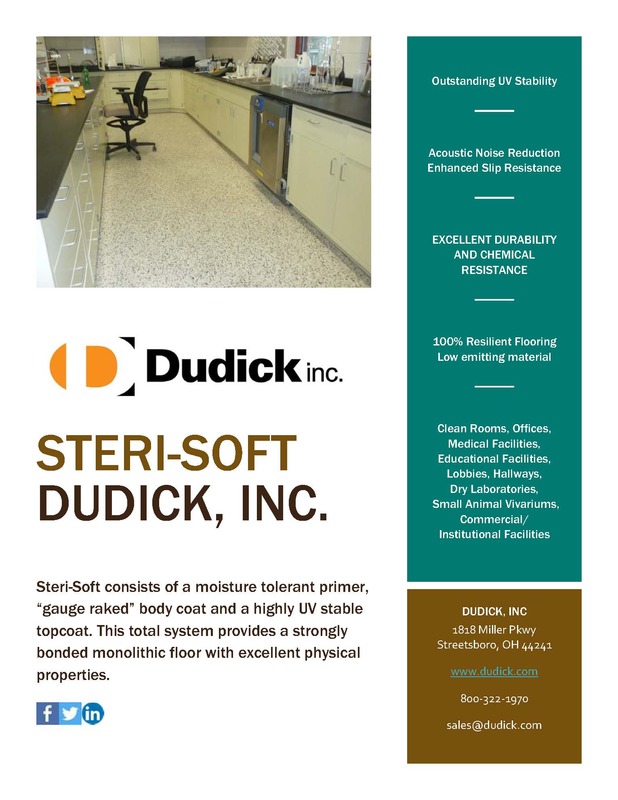 Dudick is a world leader in custom-engineered high-perfor­mance floorings, coatings and linings. We have the best prod­ucts for your application needs, and we stand behind them. We make sure you get exactly what you need when you need it for your specific situation. All Dudick products are engineered and manufactured for the highest possible performance level. Looking for a single source of low odor UV stable wall and floor coating systems for critical food and beverage industry? See the Dudick difference. Family-owned and committed to your satisfaction, Dudick is there 24 hours a day. Dudick is the one source for wall and floor coatings that are easy to sanitize, fast curing and low odor systems for damp concrete surfaces. To see why Dudick Protecto-Flex systems are the leader in crack bridging secondary containment coatings for absolute leak-proof containment. Advanced new coating technology allows for nearly 1/8” crack bridging (100 mils) with a written warranty. Read about the comparison of crack bridging capabilities of various epoxy systems vs Dudick Flex coatings. Advanced urethane technology was used to develop the next generation of steam cleanable seamless floors. Dudick systems were chosen by agencies within the U.S. government (NIH, Homeland Security, CDC) for containment of – 350° F liquid nitrogen. These seamless floorings are resistant to thermal shocks up to 400° F and as low as – 350° F.
Looking for a supplier that can furnish wall and floor systems with zero VOC’s, UV stable, low odor? Dudick Inc. is the company of choice by leading architects and designers for super critical applications. Chosen by NIH, USDA, Army Corps of Engineers and Homeland Security to protect high containment infectious disease labs…when others failed! Most systems will contribute to LEED® credits for your next project! We also offer products for commercial and university needs. To see why Dudick is the leader in resilient seamless floors formulated of 100% urethane – UV stable and 100% solids. We use advanced urethane and Nano technology components in Steri-Soft for the first UV stable true elastomeric flooring. the perfect choice for operating rooms, hallways and laboratories, where noise control and comfort are important factors. Advanced coating technology is why Water and Water Treatment engineers and designers choose Dudick linings for the largest UV treatment plant in the world as well as the largest water filtration plant in the world. With written 100 mil (nearly 1/8”) crack bridging warranty – no one else will do that. Others were tried but only Dudick was specified by 2 major metropolitan areas.